Judson Eber Conant lived from 1867 to 1955. He was a pastor and evangelist and served as a field representative for Moody Bible Institute in its early years. 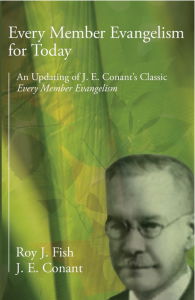 Dr. R.T. Ketcham said of him, “I consider Dr. Conant one of the best evangelists on the continent.” I had never read him but am always looking for solid books on evangelism. The main theme of this book (1922) is that evangelism should naturally take place outside the church as each member becomes an evangelist to the lost. He saw the beginning of our own age where the church service is sometimes the only evangelism taking place and the pastor the only one giving the gospel. Conant felt strongly that the church must take the gospel to the world. He also saw the beginning of worldly methodologies used to get people into the church. In those things he sounds much like a Tozer or Ravenhill.